The people over at MakoMod have put together a Switch that looks like it came straight out of The Legend of Zelda: Breath of the Wild. It’s pretty meta. In the game, Link uses the Sheikah Slate to take pictures, look at maps, and figure out where he needs to go. It was pretty clearly designed to mimic the Wii U’s gamepad, but then the Switch came out which didn’t have a dedicated second screen. 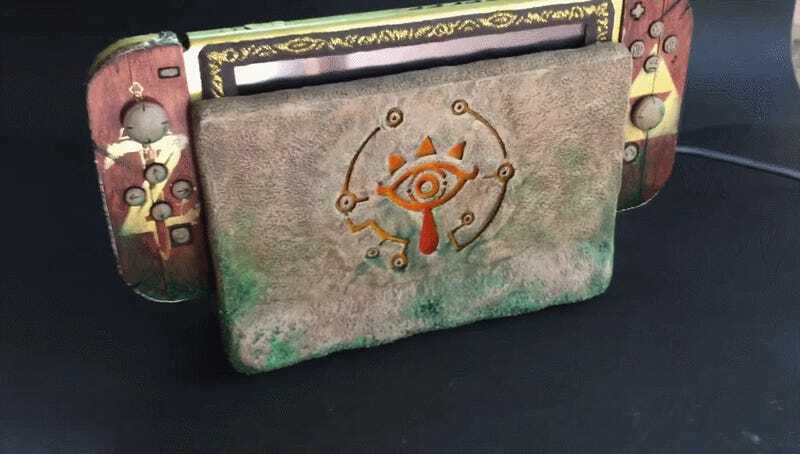 The Switch itself kind of looked like an upgraded Wii U gamepad itself though, in effect forming a weird sort of connection between how Link used the Sheikah Slate and how players control Link using something that sort of looks like a Sheikah Slate. But the Sheikah Switch as ModMaker is calling it takes the whole thing one step further by letting you play Breath of the Wild using a device that looks like something you might find in Breath of the Wild. If Link could play a Switch, and why not since he already has a t-shirt promoting it, it would probably look exactly like this. Decked out in a wood and stone veneer, the thing looks damn impressive. People joked when the Switch came out that it was a $300 device for playing Zelda, and they were sort of right given the meager launch lineup. The Sheikah Switch seems to have taken that sentiment to heart.